This striking top is an oversized, drapey boatneck tee that boasts a playful stripe pattern, decorative outside seams and slit shoulder detail that makes this tee a perfect garment for a breezy summer day. 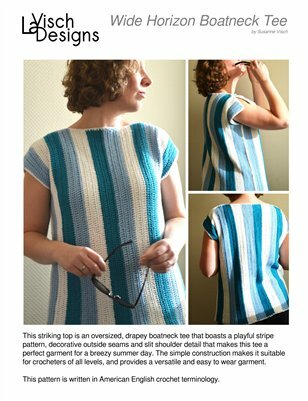 The simple construction makes it suitable for crocheters of all levels, and provides a versatile and easy to wear garment. This pattern is written in American English crochet terminology.